Thursday's ride has something for everyone. Start time is 6:00 PM 3/14 thru 4/11, and then moves to 6:30 till fall. Beginning 9/5 will start at 6pm with lights as long as the weather permits. Lights are recommended for all rides at all locations from September on. "A" group leaves first, with all other groups leaving shortly thereafter, unless otherwise specified. Departure times are prompt, so please plan accordingly. This weekly ride departs from Mountain Road Cycles in Chagrin Falls and features a series of rides that repeat throughout the season. Rides run from the beginning of April to the end of Sept. Description: This weekly mapped ride takes advantage of the quiet rural roads of Lake and Geauga counties. Concord is a great launching point for some of the best riding in Northeast Ohio. The rides start in Concord is just a quarter mile from I-90 and Rt 44. Social Start Time: 6:30 pm ALL Season! Start Time: 6:30 pm ALL Season! Description: This weekly ride takes advantage of the quiet rural roads of Lake and Geauga counties. Concord is a great launching point for some of the best riding in Northeast Ohio. The rides start in Concord is just a quarter mile from I-90 and Rt 44. Wednesday's ride has something for everyone. Non-members must sign a waiver to ride. The C ride is a great compromise where the pace is all about Fun! Ride Leader, Greg Ubic, has been leading this ride for a few years. This group always leaves at 6:30 PM and covers 15 to 25 miles. No drop ride. No pre-ride maps available, route is based on the group's abilities and the ride frequently regroups. Ride Leader, Frank Zoretich has been leading this ride for 10+ years. This group meets at 7:00 pm and route distances average 15-22 miles. There are no maps and the ride frequently regroups. Frank hosts a monthly potluck at the park's Forest Picnic Area, all CTC members are invited! Start at Wyman Park on SR86 in Concord, less than a mile south of 84. This ride will take you along the Lake Erie plateau through many of the nurseries and vineyards that make this area unique. One of the few routes in this area that are nearly void of any hills. If you're looking for a tandem friendly ride, this is it! Water is available in the Madison town square, and restaurants are available in Madison and Geneva. All CTC members are invited! -- Read "About Riding with the Club"
Enjoy an early season romp to Chardon for the Geauga County Maple Festival. Come hungry as there will be all you can eat pancakes before the trip back to North Chagrin Reservation. Don't eat too much as the there will be plenty of hills! Enjoy an early season romp to Chardon for the Geauga County Maple Festival. Come hungry as there will be all you can eat pancakes before the trip back. Don't eat too much! Travel to either Russell (21 miles) or Burton (41 miles) on this early season trip through some of the scenic areas of central Geauga county. 41 miles - A/B/C Pace - Kirk Bickel, B or C depending on attendance. Ride through the farmlands of northern Geauga County and western Ashtabula County on lightly travelled roads to see the old towns of Windsor and Footville. Return route goes through Thompson with a great view of Pennsylvania off in the distance. Be sure to bring a few extra energy bars and plenty of water as the services are limited on this route. Travel downtown to see the Christmas Story house by way of the Towpath. Food options are available along most of the route - don't miss the great dessert options in Little Italy! Take a ride out to scenic Amish country through the towns of Burton, Middlefield and Parkman. Then head south to northern Portage County to check out the small towns of Garretsville and Mantua before returning home. The terrain will vary from rolling hills to long stretches of nice and flat. Plenty of places to stop for refueling along the way. All CTC members are invited!-- Read "About Riding with the Club"
Ride to Madison, Geneva or Ashtabula on this route that visits the southern shores of Lake Erie. We are looking for volunteers for Sunday in June cycling event this year. This is the 43rd year that CTC will be orchestrating this event. We would not be able to do this event without volunteers. Volunteers will receive a t-shirt (see below), a free lunch, you can ride the SIJ event for free (if your shift allows), and a post-ride on Monday for any volunteers that want to ride that day also. There will be the potential for volunteer-only pre-event rides that will help the SIJ Route Team assess the SIJ routes. If you sign up to be a Shift/Area Leader, you will also receive free pizza during the leader training/meeting the week prior to the event. To find out more about Sunday in June visit Sunday in June website and Facebook SIJ event. When you register, you will be asked to pick a task(s). If it has already been filled, it will have FILLED in front of the task. Here are the tasks that are possible, the list below will not be updated with FILLED. 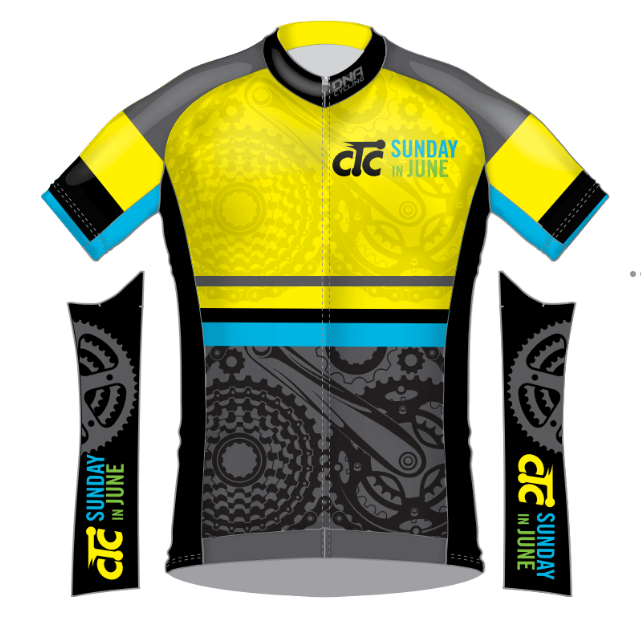 SIJ Century Jersey by DNA Cycling! 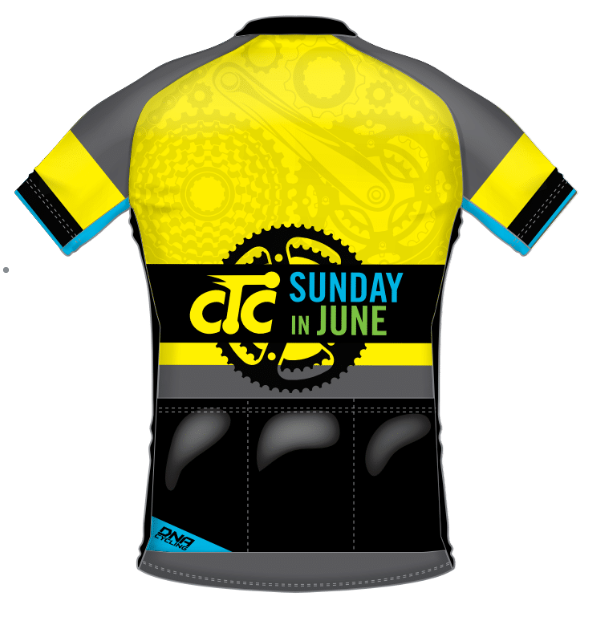 We are offering Men's and Women's Century jerseys. If you would like to purchase this jersey and have it delivered to your home, please click the jersey picture to go to the DNA SIJ store. Be sure to check the size chart, they typically run small by 1 size. Urgent: Order by 4/7/19 for home delivery before Sunday in June event! We will be giving all new volunteers a unisex t-shirt. For those of you that have a t-shirt already (blue with chainring logo), please wear it while doing any volunteering. If you have lost it or it no longer fits, please order a new one. Please be sure to indicate your size. Deadline to signup and receive a volunteer T-shirt is 6/1/19. 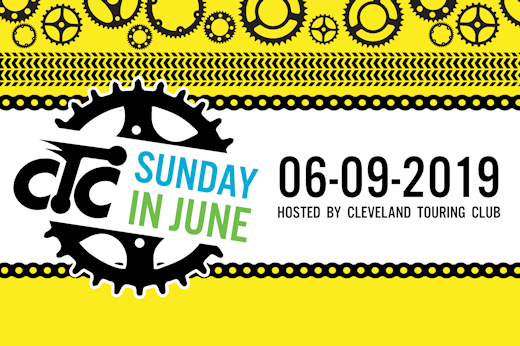 Join more than 800 cyclists for our 43rd annual Sunday in June ride hosted by the Cleveland Touring Club. A thrilling spin through the heart of Northeast Ohio’s Amish countryside, it is organized by cyclists for cyclists! All cyclists are welcome, from casual recreational riders to road warriors to touring cyclists to energetic triathletes. Ride through scenic rural roads while enjoying the sights and sounds of the Amish countryside of Ohio’s Geauga County. A map detailing each of the routes will be provided prior to the ride and also at registration check-in tables. Additionally, all routes are well marked with painted arrows on the road. The ride is based at Century Village in Burton, Ohio. 6:30 – 9:30 am: Check-in tables open for ride registration and packet. 4:00 pm: All cyclists off the roads. TBD. Maps will be included in an email 1 week prior to ride and also updated on our sundayinjune.com website. You should be in good physical condition to complete the ride at your own pace. For the 65 mile and longer routes, you should have already ridden 100 to 200 miles this season. Your bicycle should be inspected prior to ride day for proper & safe operation or visit one of our bicycle shop supporters long the routes. Event/Ride will be held rain or shine - please come prepared. SIJ Century Jersey by DNA Cycling! Be sure to check the size chart. Typically runs small by 1 size. We are offering Men's and Women's Century jerseys for $60. home delivery before June 9th event! Hurry to Hudson - or Not. Take a scenic ride through northern Summit and Portage counties with stops along the way in Hudson and Aurora. For those of you arriving in Hudson before 10:00 AM, you can check out the sweets at Great Lakes Baking Co. at 85 South Main Street (opens at 8). After 10:00 AM, you can stop at Main Street Cupcakes at 238 North Main Street if you prefer. On the return route, a water only stop can be made at Sunny Lake Park in Aurora. Terrain is flat to rolling hills. Take a meandering tour of Geauga County's scenic back roads with stops along the way in Burton, Chardon, and Punderson State Park. Terrain is rolling to hilly, so be sure to bring plenty of water and food to re-fuel as you go. -- Read about Riding with the Club"
Ride to the historic Welshfield Inn for lunch. Enjoy the patio or indoor seating. You can order off the menu. There are 50 or 62-mile routes to choose from. The 50 miles route is the minimum to get to the restaurant and back. A great destination ride! Ride to the historic Welshfield Inn for lunch. Enjoy the patio or indoor seating. You can order off the menu. Need to get away? Why not spin your way to Jamestown, Pennsylvania for lunch in another state before returning to Burton. Shorter options are available which turn around at Mesopotamia and Mosquito Lake. Please join fellow members for the summer's CTC "Signature Ride" and lunch near Austinburg, OH! These are self supported rides. Bring your own food and water. If you aren't sure of your group riding skills, please start with the Social riders. A/B group: last year's average pace was 18.6 mph. The A/B route goes north on the Austinburg-Greenway Trail and then west along the lake shore. All routes include at least 5 miles on the Austinburg-Greenway Trail. All routes : flat to rolling terrain. LUNCH TIME: 11:00am - 2:00pm --> club members who ride will be treated by CTC to a burger and soft drink at Paradise Bay restaurant! Get a food voucher from a Ride Leader or Event Manager. Circumnavigate Cleveland's famed metroparks on this unsupported century around the Cuyahoga Valley. Beginning in North Chagrin Reservation you will travel clockwise through many Metroparks before finishing with a trip through downtown Cleveland. Marvel at the shores of Lake Erie. A metric route turns back sooner for those who want a shorter day in the saddle. Multiple food stops available along the way in downtown Cleveland, Rocky River, Brecksville, and on the towpath. Change: Social ride will meet at 9:00AM, same location. Visit Thompson Ledges just east of town (27 miles) or venture out to see the Harpersfield covered bridge for a beautiful lake shore ride. Circle the historic Ravenna Arsenal in this loop into the southern reaches of northeastern Ohio. Shorter options turn around in Garrettsville (25) or Mantua (51). Water and facilities are available in Newton Falls for those doing the long route. Ride through scenic rural roads while enjoying the sights and sounds of the Amish countryside of Ohio’s Geauga County. A scenic out and back loop of the eastern branch of the Emerald Necklace. Travel south along the Chagrin River, across the ridge and into the Cuyahoga Valley to Brecksville. Food stops available in Chagrin Falls, Bedford, and Brecksville. Water available at the top of Gorge Parkway. Come join us as we cruise past nurseries, covered bridges, and the lake shore communities of scenic Lake and Ashtabula Counties. The 54 and 75 mile routes travel through the resort town of Geneva-On-The-Lake. Be sure to stop for re-fueling on the way back at Compadres Mexican Restaurant in Madison for the best burritos around. Compadres Mexican Restaurant (440-983-4755) opens at 11 a.m. Sundays. Expect rolling terrain on the first half of the routes and mostly flat terrain thereafter (20 feet/mi. overall). The 75 miles route traverses 8 flat miles of the Austinburg-Greenway Trail. Ride through the wooded hills of northern Geauga County and farms of the south. Water and food is available in Chesterland and Chardon. The long route is 53 miles. This is the annual, autumnal equinox, century ride -- the self-supported "Tour Along the South Shore of Lake Erie" (TASSLE). TASSLE was an organized, supported, two-day annual event from the 1970's through 2002. The original ride ended due to lack of interest by the organization that hosted it. However, Brian Speck, CTC member, has been doing his best to keep the ride alive! It is an out-and-back ride, mainly on Lake Road (Route 6), from Lakewood to Sandusky. Lakeview Park in Lorain is the starting location for riders who opt for a half century ride, and a beautiful spot for the century riders to rest and enjoy the scenery. The route also passes through Vermilion, with its scenic lighthouse, on the way to the turn around point at the "Welcome to Sandusky" sign -- be sure to take a selfie there! Lunch in Huron on the way back, and another rest in Vermilion and Lorain before returning to Lakewood. Ride Terrain/ Elevation: nearly flat (20 ft/mi.) -- the "hills" are bridges and low areas that creeks and rivers carve into the terrain. Note to all riders: This ride is not supported -- bring cash for water stops. Being that it is after Labor Day, we cannot depend on local parks to have facilities open (restrooms, drinking fountains, etc). We must rely on convenience stores, restaurants, and gas stations along the route. Stop at Punderson State Park for water and then make your decision. Riders wishing for a short tour can return to Chardon via Burton. Those wanting to go further can continue on to Hiram. Be prepared for moderate to rolling hills. Take a break from raking leaves with a ride in Lake and Geauga Counties for hot cider and cookies at Eddy's Fruit Farm in Chesterland, OH. Overall this is a hilly ride at 55 ft./mi. elevation, however there are several sections with nice rollers. This rural tour shows off the beautiful fall colors of Northeast Ohio. We exit from Gurney School and ride east on Bell/Music and eventually loops through Punderson State Park and town center of Burton. A Tandem Friendly ride!